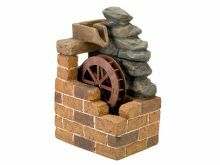 A natural style water feature suitable for outdoor and indoor use. Water cascades over 2 waterfalls between an old woodland finishing in a pool at the bottom. Pools are fitted with L.E.D. lights to enhance and illuminate your feature at night.